Purchasing a fireplace and having it installed can be stressful - but it doesn't have to be that way. Above all, you will need to make sure your installation is safe and effective. While you will want to ensure that the process is as smooth as possible, it is important to be aware of the common mistakes that can derail the process. Below are the five areas with the most common mistakes made during the process of finding, purchasing, and installing a new fireplace. There is a National Code that is used as a baseline for the installation of fireplaces, heaters, and other hearth products, and a hierarchy of guidelines for these units. Above that national code compliance, you should comply with the manufacturer's product manual, and above the product manual, you should comply with local code enforcement. Make sure that you speak with local code authorities before beginning any sort of fireplace project, this way, you won't get a stop work order in the middle of your construction. Many states have overarching laws regarding hearth appliances, such as California's outright ban on vent-free products, and D.C.'s ban on vent-free products in bedrooms and bathrooms. It is important to note, however, that your city or county may have independent guidelines regarding hearth products, and that they must be consulted. Locations where vent-free is allowed by the state but not by the city or town, include but is not limited to New York City; Austin and Houston, Texas; Freemont, Nebraska; and Manchester, New Hampshire. Failure to comply with local code can and has come back to haunt many homeowners when it is time to sell or renovate a home, as an inspector may put your entire project on hold until the installation is up to code. Failure to comply with local code can and has come back to haunt many homeowners when it is time to sell or renovate a home, as an inspector may put your entire project on hold until the installation is up to code. Things that code enforcement authorities may have strict guidelines on are clearances to combustibles, in addition to the clearances required by the manufacturer, the ability to install a vent-free appliance in your home, the construction of a chimney, or any other safety feature they deem necessary. One of the single most important aspects of installing a fireplace, and often the most overlooked, is the selection of a suitable installer. You wouldn't want a pet groomer to trim your hair, so why would you choose to have someone who has little to no relevant experience to install your fireplace? The majority of manufacturers will specify in the installation manual of an appliance that the unit needs to be installed by a qualified installer. If this is not done, the warranty may be void. There are a few different professionals who are qualified to install a hearth product and it is important to know the differences between them. The majority of manufacturers will specify in the installation manual of an appliance that the unit needs to be installed by a qualified installer. First, are the NFI Certified Installers. These installers are certified by the National Fireplace Institute and have passed comprehensive exams on one or more hearth related fields, including Wood Burning, Gas Burning, and Pellet Burning. Here at eFireplaceStore.com, we can speak to the thoroughness of these exams, as we have 6 NFI Master Hearth Professionals on staff. NFI certified installers can be found by entering your zip code into the NFI registry. It is important to note that many of the people in your area with these certifications will be installers who work for specific companies that will only install a unit that they have sold. If this is the case in your area, you may not be able to have an NFI certified installer work on a fireplace that you have purchased online. This would be a case where we would discuss the next two installers. The second possible installer would be a general contractor. Often they will be more experienced in some of the aspects of fireplace installation, such as the framing of the unit and the building of a chimney chase, due to their construction background. When discussing the installation with a general contractor, you will want to make sure that they have experience putting in a hearth appliance - and if not, that they have someone on their crew that does. The third suggestion would be a licensed plumber or gasfitter. They will be most appropriate if you are installing a gas hearth appliance though many with experience in installing the gas will also be able to frame and vent the unit properly. As with the general contractor, you will want to discuss their qualifications and make sure they are the right person for the job. When your installer has completed the installation, you should make sure that they test the unit to see that it is working correctly before leaving the job site. The overwhelming majority of issues with new hearth appliances trace back to installation error. An installer should never leave you with a non-functioning appliance. Provided all of these specifications are met, there should be no issue if a warranty claim needs to be filed or manufacturer's assistance is requested in troubleshooting an issue. A fireplace can change the entire ambiance of a home. It provides warmth, atmosphere, and an aesthetic focal point for any room. Some fireplaces will provide supplemental heat on cold nights, while others serve an entirely decorative purpose. It is important to know which unit provides what you are looking for before making a purchase. As a note, gas and pellet appliances are meant to be zone heaters and don't work well as a primary heat source unless the home is less than 1,200 square feet or so. Wood Burning units will almost always have a higher heat output than gas appliances. It is important to know which unit provides what you are looking for before making a purchase. There are two kinds of wood burning fireplaces: classic open-faced fireplaces, and closed combustion units that are rated by the EPA. 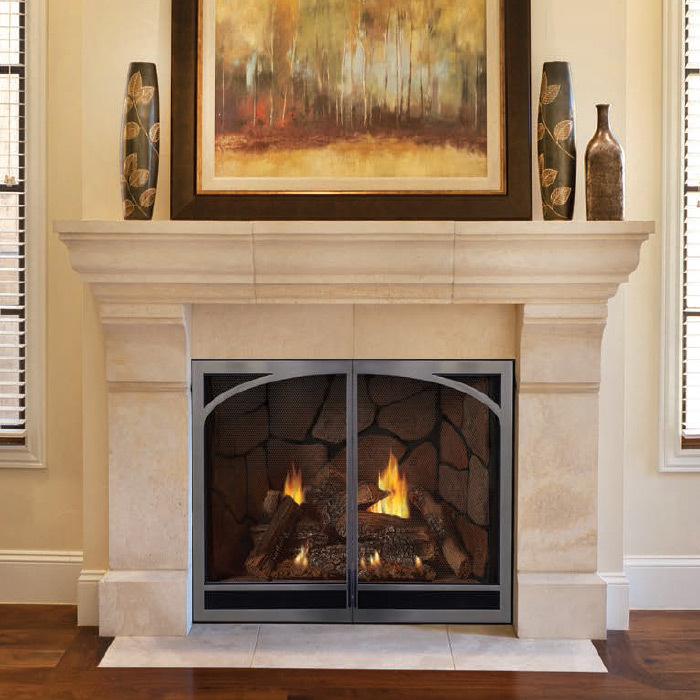 An open-faced unit will provide you the traditional look of a fireplace that was built directly into the home. While some versions of these fireplaces can have a blower installed, these fireplaces will still lose considerable amounts of heat through the chimney. Closed combustion units, however, have both the look and attributes of a wood stove that's been framed directly into your wall. 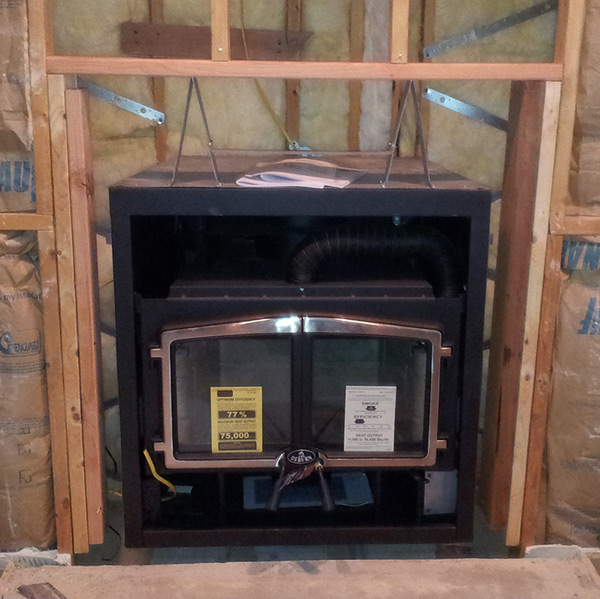 While wood stoves require a certain clearance to combustibles and floor and wall protection, these units can be framed. They are often rated by the EPA and put out a significant amount of heat. 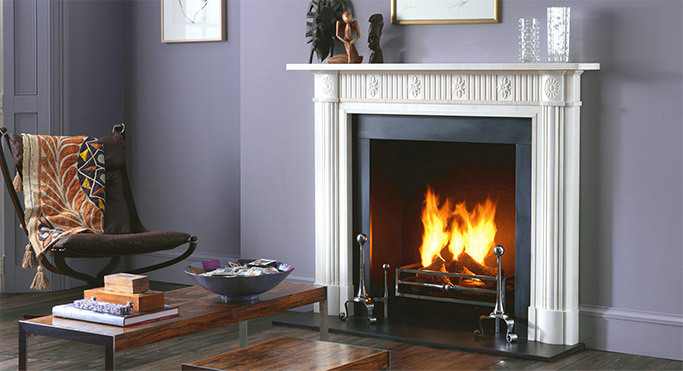 As with wood burning fireplaces, gas fireplaces and gas log sets also come in both decorative and heating versions. A vented gas log set is - much like with an open faced wood burning unit - going to lose a considerable amount of heat through the venting. If you're looking for heat, and it is approved by your local code enforcement, a vent free gas log set would be ideal, as there is no loss through the venting. Vent free appliances operate at an efficiency that allows for them to draw combustion air from the room and release only water vapor and carbon dioxide during combustion. Please bear in mind that with vent-free appliances, people with sensitive noses or bad allergies sometimes complain of an odor, which is caused by the breakdown of methyl mercaptan, the additive that allows otherwise odorless natural gas and propane to be detected in the event of a gas leak. Additionally, vent-free units will have an effect on individuals with asthma, COPD and other respiratory illnesses. Direct vent gas fireplaces operate at a higher efficiency than open faced units, so they will provide more heat than a vented log set or B vent gas fireplace, but will still lose a small percentage of heat through the venting. They have a closed glass front and venting that allows for both the exhaust of flue gases and the supply of combustion air. While they are less common than they were in years past, there is also the option of a B-Vented unit, which will draw air for combustion from the room and exhaust gases out of an aluminum chimney. These are considered purely decorative, and will put out almost no heat. The size of your home will be a big part of the decision making process when purchasing a fireplace. If not done correctly, you can under or overheat your house, or you could find that your fireplace is either non-functioning or only works for certain amounts of time. The BTU (British thermal unit) output of a fireplace will give you an idea of the unit's heat output. As a general rule of thumb, 35,000 BTUs will heat 1,000 square feet. As such, you can divide the BTUs of any unit you are looking at by 35 to determine the square footage the unit can heat. Meaning, a 30,000 BTU unit (the higher end of our most common BTU amount in gas fireplaces) will heat 857.14 sq./ft. Or, you determine the square footage of the area you'd like to heat, and multiply that number by 35 to determine the number of BTUs required to properly heat the area. The average square footage of American homes (as calculated by the American Census) in 2010 was just shy of 2,400 sq/ft, meaning a massive, and rather rare, 84,000 BTUs would be needed to fully heat the average home. The larger your home, the more likely you will need to utilize zone based heating to get an even level of warmth throughout your home, if you wish to utilize hearth appliances as your primary heat source. 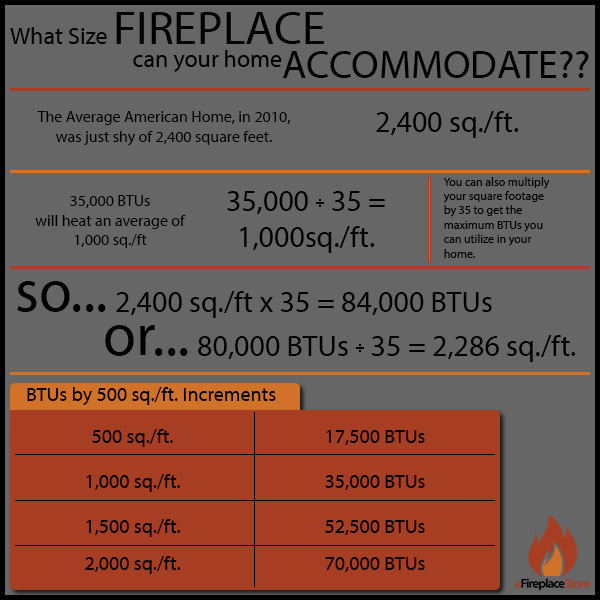 The size of your home will be a big part of the decision making process when purchasing a fireplace. In addition to determining heating expectations from the various types of vented appliances, it is also an imperative part of selecting a vent free appliance. Vent free appliances will list in their product manuals the minimum cubic feet necessary for oxygen levels in the room to stay safe. All vent free fireplaces will come with an oxygen depletion sensor, which is a hole in the pilot where the air is drawn. If the oxygen level in the room goes down, the unit will shut itself off before the level drops to dangerous levels. As well as the size of the area you are heating, you will also want to consider the altitude of your home. Gas fireplaces will have a guideline to determine whether your altitude can sustain the amount of oxygen in the air needed for the unit to function. While certain higher elevations can be accommodated, by either switching out the gas orifice or modifying the gas input, this is a crucial step that your installer must take to make sure your fireplace can perform optimally. In addition to combustion air considerations, appliances installed above 2,000 feet should have their BTU inputs derated by 4 percent for every 1,000 feet above sea level. Finally, the choice of accessories is just as important as any other choices you make during the fireplace purchase and installation, and you need to ensure your venting component and accessory selections are compatible for your new fireplace. All fireplace manufacturers have specific venting and accessories that are meant for use with their units, they have been tested together for safety purposes, and are the only products approved to be installed with a certain fireplace. This includes optional brick liners, blowers, surrounds, and media kits. All proper parts will be listed in the product manual for the fireplace. All fireplace manufacturers have specific venting and accessories that are meant for use with their units, they have been tested together for safety purposes, and are the only products approved to be installed with a certain fireplace. 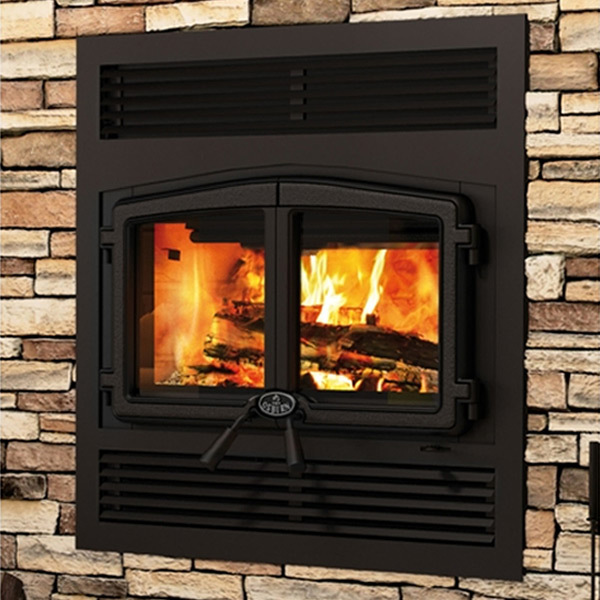 The venting of a fireplace must be done exactly to manufacturer's requirements with the appropriate parts. Manufacturers do not offer adapters that can allow for new fireplaces to connect to older pipes, even when made by the same manufacturer. Wood-burning fireplaces have two different kinds of pipe, air-cooled pipes with no insulation between the inner and outer walls for open faced units, and insulated pipes with packed insulation between the inner and outer walls for closed combustion units. With gas fireplaces, you will have units that are direct vent, meaning they have a closed glass front and venting that not only exhausts flue gases but also draws in combustion air. Additionally, there are some B-Vent fireplaces with aluminum pipe and a very small space between the inner and outer wall. Again, the manufacturer will specify the exact type and brand of venting that can be used with the fireplace you purchase, and this must be followed exactly. Accessories will also be tested and approved for a fireplace. This is not only a safety issue but the way to determine what will fit your fireplace. Manufacturers often don't list the size of things like fireplace doors, brick panels, or surrounds. They will be designated for specific fireplaces, which takes out the possibility of purchasing the incorrect part. In conclusion, if all of these steps are taken into consideration, your new fireplace will be purchased and installed with the least amount of stress possible. You should come out of this process with a new addition to the décor of your home that will delight company and provide comfort in your home, whether it be through warmth or the familiarity of a cozy fire. If you have questions or concerns at any point during the buying and installation process, please lean on the experts here at eFireplaceStore.com. Our NFI Master Hearth Professionals have the knowledge and the expertise to make sure you avoid these and other common mistakes. With five years under his belt here at eFireplaceStore, Brennan is one of our National Fireplace Institute (NFI) certified technicians. Additionally, he is an NFI Certified Master Hearth Professional, which means he is certified in all three fields - wood, gas and pellet. 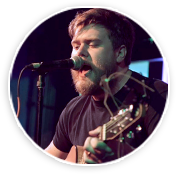 During his free time, Brennan is a singer/songwriter that plays in two different bands, one folk punk and one metal. Born here in Memphis and the oldest of three, he is married to his wife Jessica and they have two dogs named Ramon and Claire.